If you’ve had your fill of chili, wings, and nachos over the last 20 weeks of football these deviled eggs are a sure crowd pleaser. 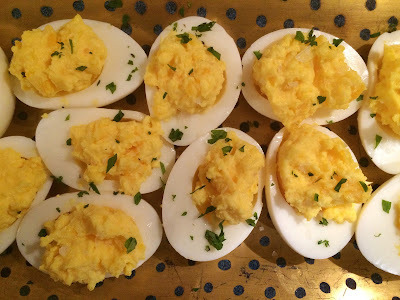 Cook and peel a dozen hardboiled eggs, cut in half lengthwise, and gently refrigerate the whites. In a bowl mash the yokes with a fork until smooth then stir in two tablespoons each of mayonnaise and sour cream. At this point there are lots of options, a couple tablespoons of truffle, garlic, or chili oil. How about some lemon and capers, crumbled bacon, or horseradish? You could also try some curry or chipotle powder or smoked paprika. Some minced smoked salmon and chives would be nice, or even some anchovy paste. Whatever you decide remember to salt and pepper to taste before spooning the mixture back into your egg white halves. Happy Super Bowl!